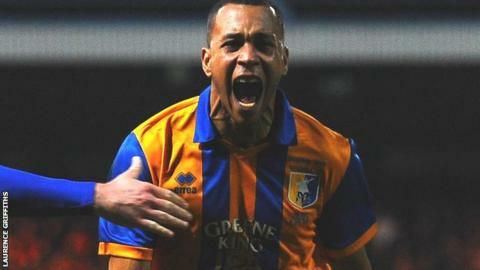 Matt Green scored his second game-winning goal in the space of five days as Mansfield beat Telford. The Stags dominated the first half as Louis Briscoe, Colin Daniel, Adam Murray and James Jennings all hit the woodwork, but it was 0-0 at half-time. Green created his goal himself as he dispossessed Karlton Watson before firing past Ryan Young. Mansfield's Luke Jones had a goal ruled out for a foul, while Telford had Watson sent off for a second yellow. Victory for the Stags, who have a game in hand, closes the gap on Wrexham to three points as the leaders were held at home by Alfreton. "We played a team who are fighting for their lives and there's no easy games at this level of football. "It was really tough but give credit to the lads, it took one goal. I said to the lads if it is one goal or six, you get the same amount of points. "Credit to the boys they are working hard and going that extra mile." "Overall I am delighted with the players' efforts today, magnificent - the only problem was the result. "We've made mistakes leading up to the goal but it was an honest mistake. We fought hard and battled well, I've no problem with what the players have given today. "I'm not bothered with the league table, the results - time will tell. We can only give our best and if we get that from every player the results the come. "Can we stay up? Who knows, but the effort today from the players was top class."